I take a daily stroll through the streets of Old Havana and Central Havana, both so flooded with tourists and Cubans that it seems as if the city might sink beneath my feet at any moment, so poor is the quality of the construction work going on everywhere and so long are the delays in completing it. I see buildings with propped-up balconies on the verge of collapse, a huge line of tourists in front of the ETECSA telecommunications office and the CADECA currency exchange office between Obispo and Compostela streets. I catch the stench of the streams of sewage that run through the streets. The chaos doesn’t just result from ongoing electrical and telecommunications installations. All of it, taken together, makes it seem as if we’re in the middle of a civil war. 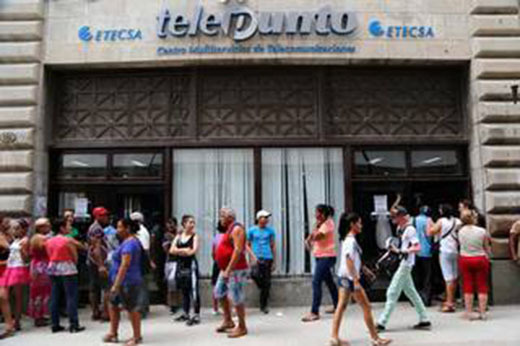 ETECSA and the Banco Metropolitano, businesses that serve both Cubans and foreign visitors, seem desperate to please the frustrated customers who wait hours to exchange a few euros or buy an internet card. And the cards are never available at any ETECSA office because they’ve all been sold on the black market at the price of three convertible pesos (dollars) an hour for internet service. That’s how the ETECSA salespeople make their living. Likewise, only two currency exchange offices and three banks are available to serve the throngs of tourists in Old Havana. Meanwhile, any Cuban who wants to use the “Nauta” email service on his or her cell phone can only do so at the Focsa Building in Vedado; none of the other ETECSA offices provide that service. ETECSA’s servers would crash if millions of Cubans were using Nauta to communicate with family and friends outside the country. And once you’ve managed to install Nauta on your cell phone you have to make three or four attempts before any connection goes through, and your account is charged while you’re struggling. Text messages arrive up to three hours late, though a delivery confirmation was sent right away. When you call Customer Service, they say everything is fine and there’s no problem. Do they want to be the only company so they can keep track of what people are saying in Cuba? So they can keep tabs on those who think differently about changing the country’s political economy? I have friends from around the world: Argentina, Italy, Canada, the United States, and France. I met many of them in the streets, during my daily stroll. I never miss the opportunity to invite them to ride a local bus so they can experience the everyday life of Cuban workers, who don’t know where their uncertain future is headed. Everything lies in the hands of the lethargic administration that controls the Cuban government and strives only to defend its own interests and preserve the order that was imposed half a century ago. This administration is intent on controlling the lives of twelve million Cubans, including seven or eight million of us who have worked all those years in the aviation, construction, and oil industries. And yet we have nothing. We have experienced firsthand the absence of labor movements or of any political party that truly represents and defends the interests of the working masses and of the nation. The Cuban administration has worked only to maintain and preserve the interests of state-owned companies that represent the power of the current government, which does nothing to improve the lives of Cubans but only offers pretexts for maintaining total control over the masses. The current government opposes making the Internet fully available to the entire country. It opposes the existence of other political parties, and other, better, telecommunications companies. Free elections are not allowed, and neither are peaceful protests by Cuban citizens. No other transportation companies are accepted. Though they don’t openly object to it, the government doesn’t want business owners to hire their workforce directly and thus be in direct contact with those who are demanding better salaries. That way the government can control the people, hold them subject to its will and keep pretending that we, the citizens, have the power. But they’re the ones who have it, and they use it to maintain a political apparatus that is alien to the life of a real Cuban citizen. My friends from around the world, I want you all to know that the Cuban people want to get rid of this political apparatus that rules over our will. All it has done is support and enrich itself at the expense of ordinary citizens’ sacrifices and hard work. And all we want is for our voices to circulate, without barriers, to all countries in every continent, so that together we can achieve a better world for everyone.